Applications for industrial vibration monitoring :All industrial machinery vibrates. The level of vibration is a useful guide to machine condition. Poor balance,misalignment & looseness of the structure will cause the vibration level increase, it is a sure sign that the maintenance is needed. 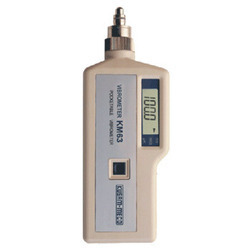 Pen type digital vibration meter, vibration sensor is built in, all in one. Acceleration, Velocity measurement, RMS measurement value. Metric & Imperial display unit. LCD display, easy read out. Complete set with the Test pin and the Magnetic base are the standard accessories. Display LCD, size : 20 mm x 28 mm. Measurement: Velocity, Acceleration. * RMS value. Operating temperature 0 to 50 ( 32 to 122 ). Power supply DC 1.5V battery ( UM-4/AAA ) x 4 PCs. Power consumption:Approx. DC 12 mA. Weight 240 g ( 0.53 lb ). Dimension Meter : 175 x 40 x 32 mm ( 6.9 x 1.6 x 1.3 inch ) Meter without sensing head, Sensing head : Round 9 mm Dia. x 30 mm. Set Magnetic base................................ 1 PC. Soft carrying case, CA-52A........... 1 PC. This product adopts piezoelectric effect of artificial polarized ceramic for design. It is suitable for monitoring of all kinds of vibrating mechanical facility, specially the vibration measurement of rotating and reciprocating machinery. The unit can measure acceleration, velocity and displacement, which is widely used in mechanical manufacture,electric power, metallurgy and general aviation etc. field. To check motors pumps heavy machinery etc. provides long and short probe head, each one is suitable for different situation measurement. Simple to use, the structure is compact, portable for carrying along with measurement. Display : 3½ Digits LCD Backlight display. Single output : AC output 2V peak (display full scale) load impedance 10KW or more earphones can be connected. Auto power off : Turns off automatically after 60 seconds. What makes the Fluke 805 the most reliable vibration screening device available? 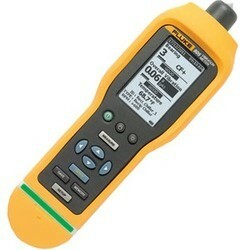 Note: Fluke supports, but does not provide, external sensors. 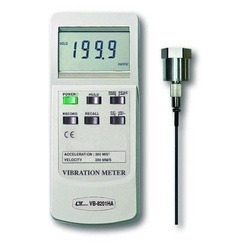 Applications for industrial vibration monitoring : All industrial machinery vibrates. The level of vibration is auseful guide to machine condition.Poor balance, mis alignment and looseness of the structure will cause the vibration level increase, it is a sure sign that the maintenance is needed. Display:61 mm x 34 mm supper large .LCD display. 15 mm ( 0.6" ) digit size. Operating temperature :0 to 50 ℃ ( 32 to 122 ).